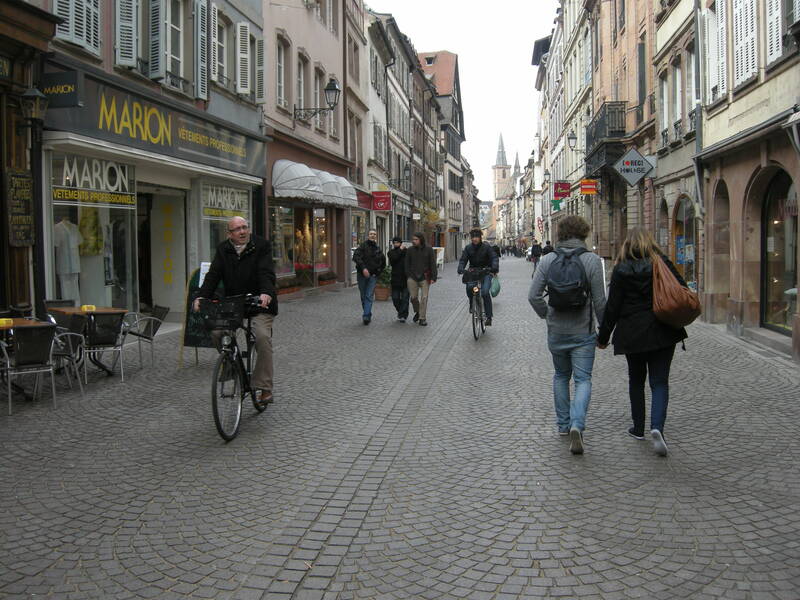 I have recently spent a short amount of time in two French cities, Strasbourg and Paris. Although only about two hours apart by train, the two places are of a very different character. 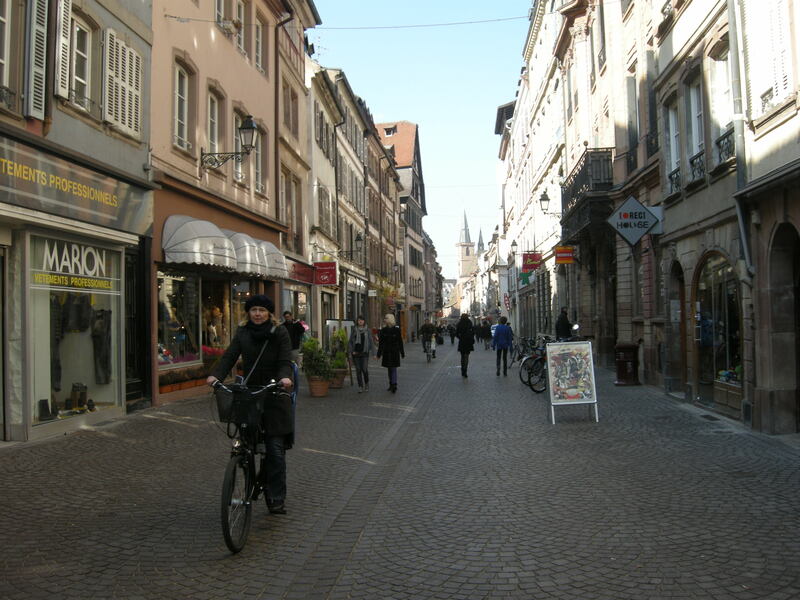 A large part of this is due, of course, to geography and history; Strasbourg lies very close to the German border and has a particularly distinctive culture. The city has been part of the Holy Roman Empire, been a free republic, then annexed as part of France, then part of Prussia/Germany, then (briefly) free again, before finally ending up as part of France. 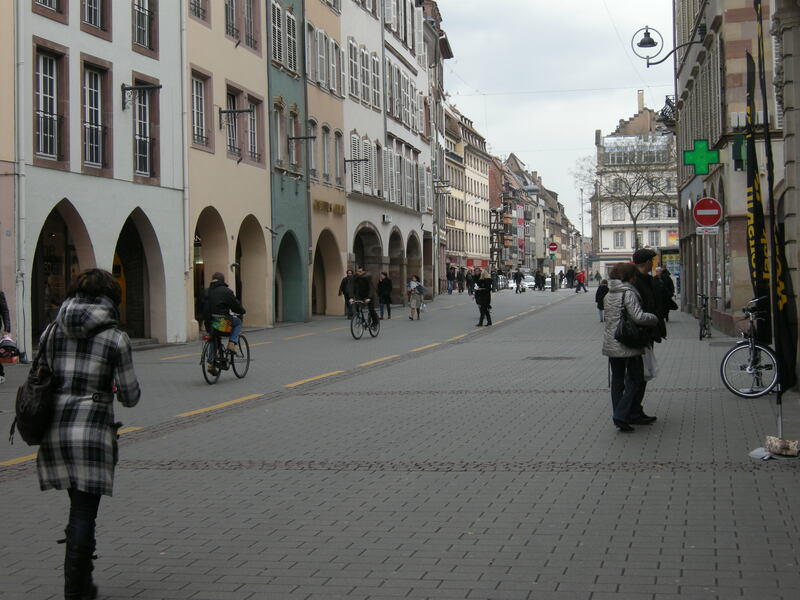 The result is a melange of architectural and cultural styles that is uniquely Alsatian. Just like the food. If it wasn’t for the French being spoken, and the French street signs, you could quite easily assume that you were in Germany. 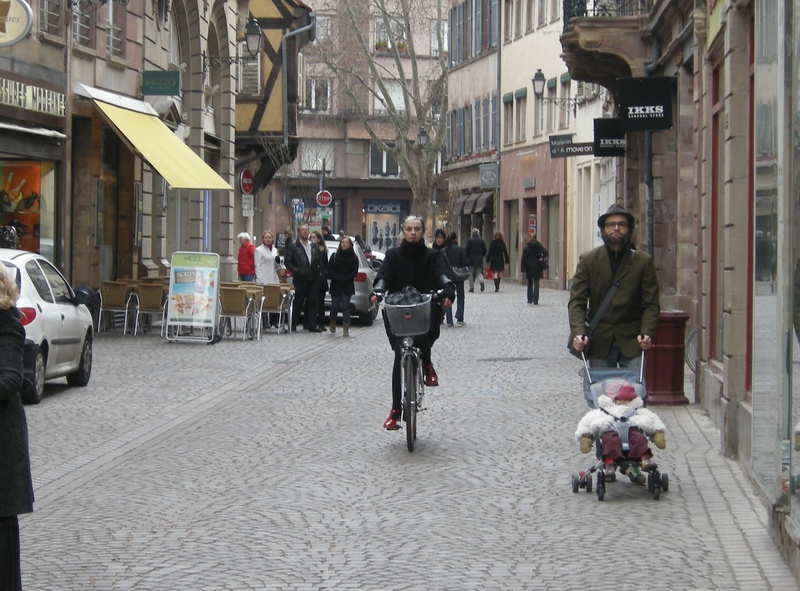 The most noticeable difference, however – at least to a person interested in walking and cycling as modes of transport – is that Strasbourg is very much more civilized than Paris. In fact, far more so. 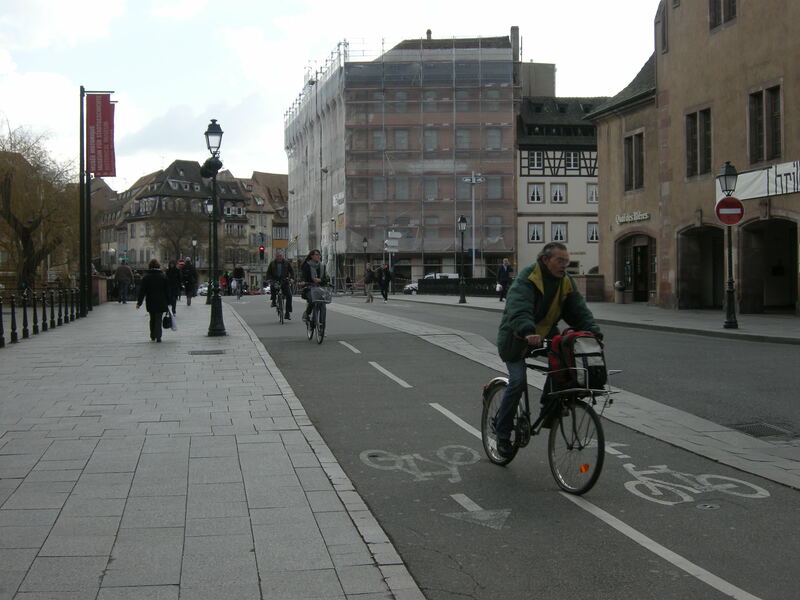 I say this not to denigrate Paris, which I think is a wonderful city, but only to emphasise just how much more pleasant it is to walk and cycle in Strasbourg. 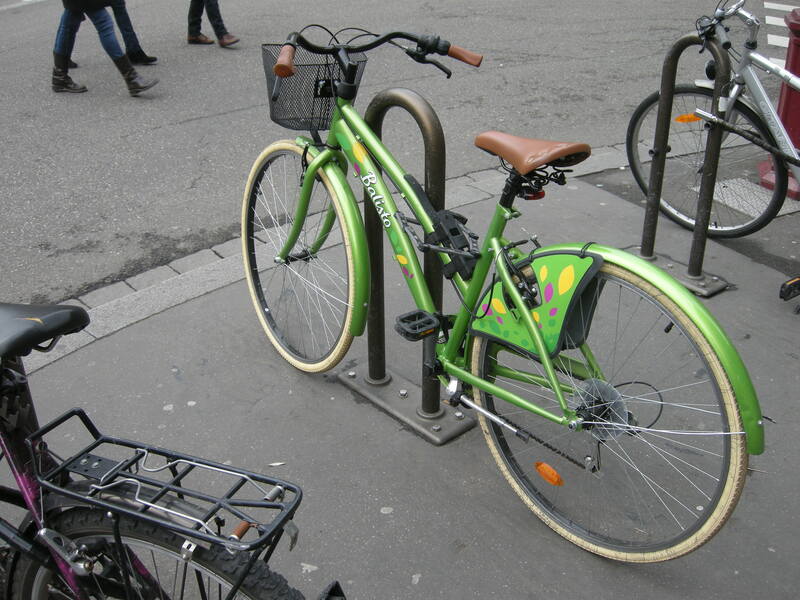 Paris, on the other hand, seemed to me to be fairly hostile for cycling – maybe not quite as bad as London, but pretty bad nonetheless. 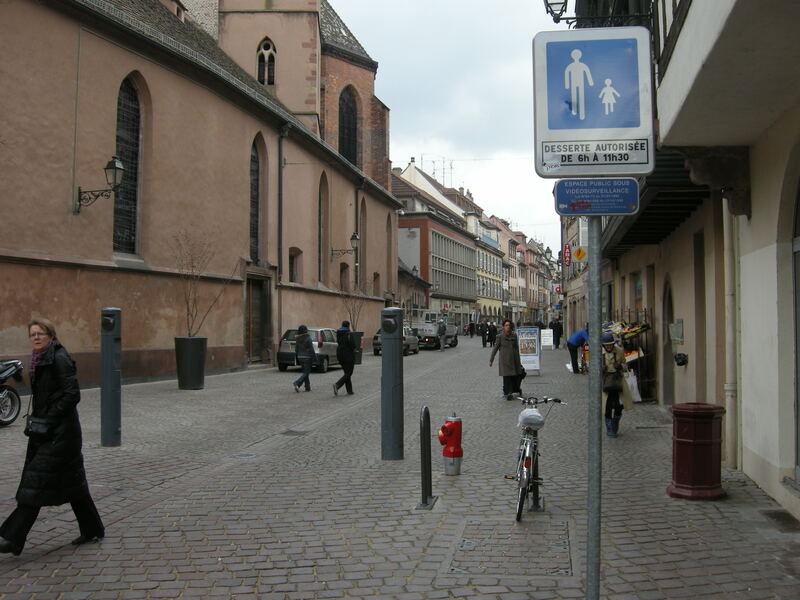 My thoughts on that city will come in a later post; for now I will focus on Strasbourg. Plenty of the barometers of a naturalised and civilised cycling culture – what you might term ‘indicator species’ – were present. 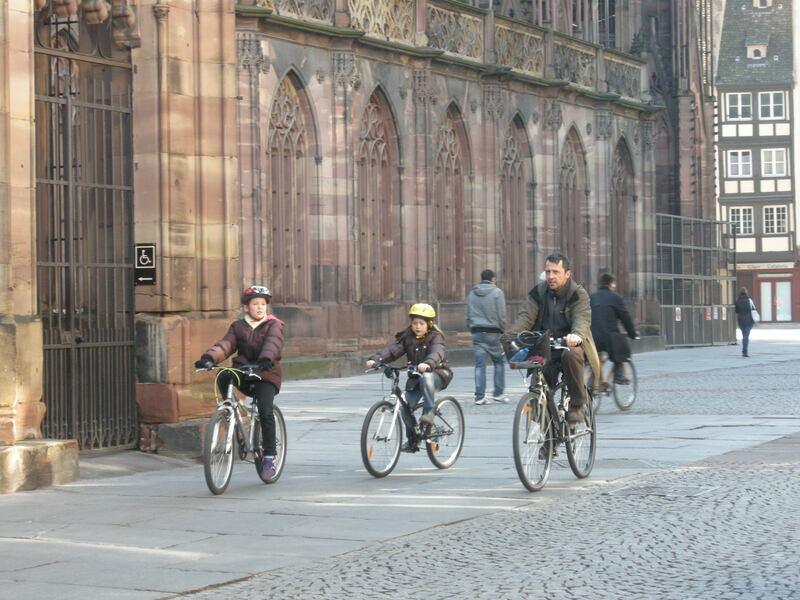 Young children cycling in a city. 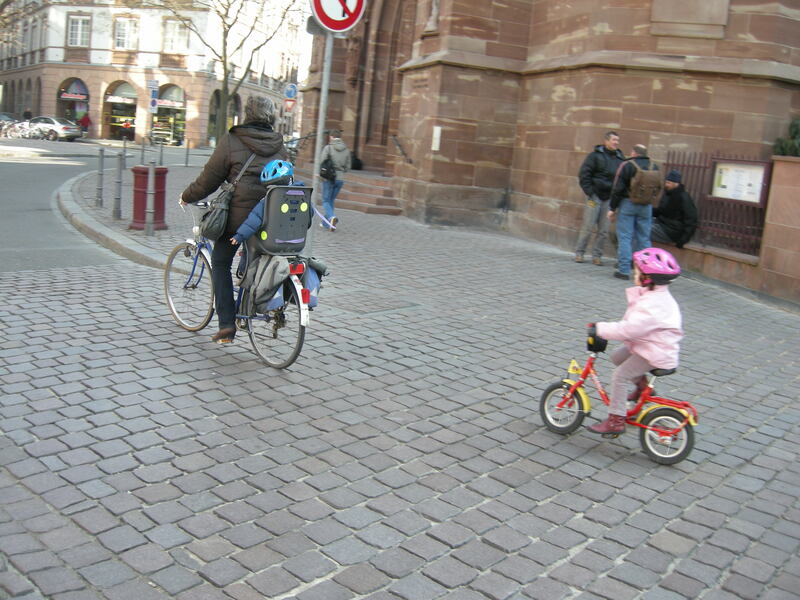 Very young children cycling in a city. 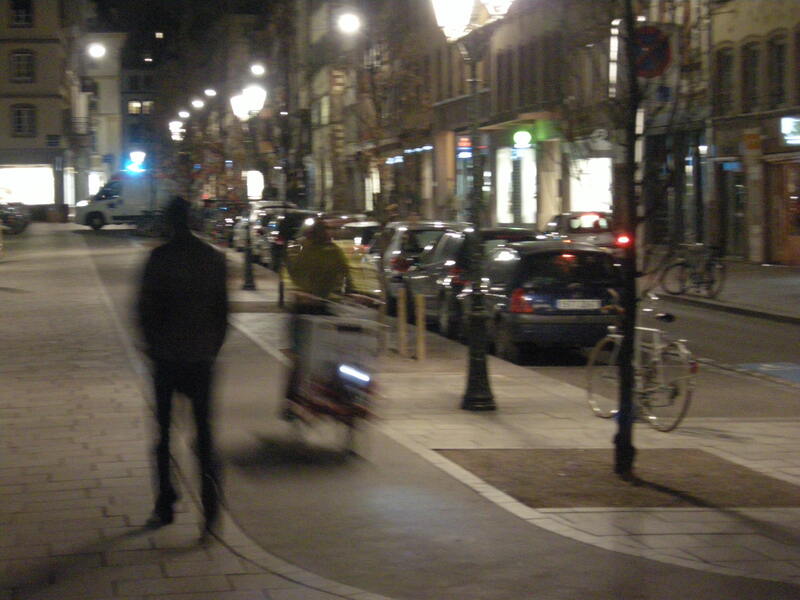 (A bit blurry due to the long exposure, but this is a Bullitt Cargo Bike). We also had casual mobile phone use. ‘The backie’ – spotted on several occasions. 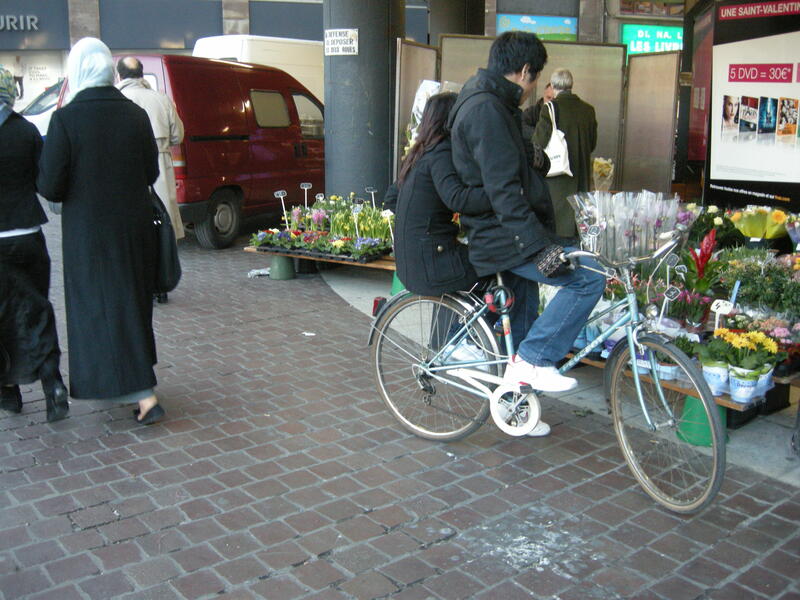 Another indicator – people were, almost without exception, cycling in their ordinary, everyday clothes. The only helmets I saw were on children – something that is also true of the Netherlands. 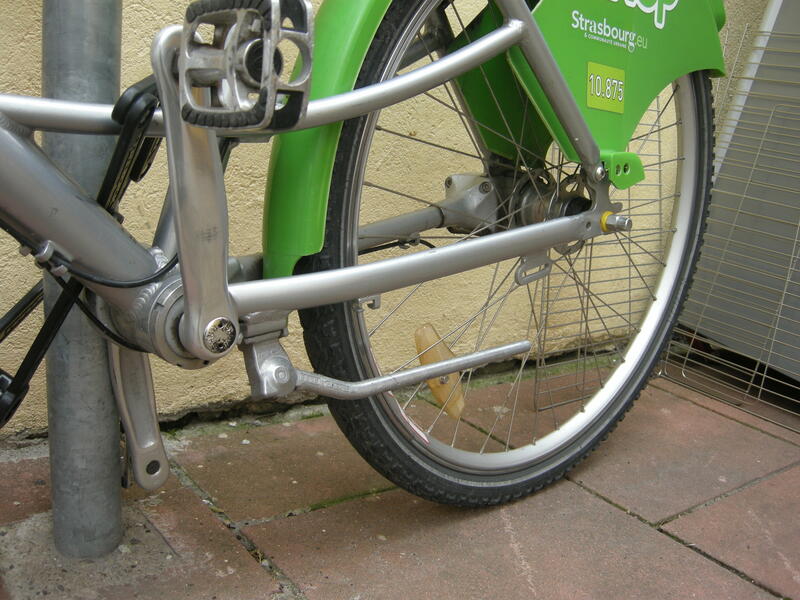 The city has a hire bike scheme, the bikes of which have an interesting driveshaft system, instead of a chain. However, I didn’t see many of these bikes in evidence. 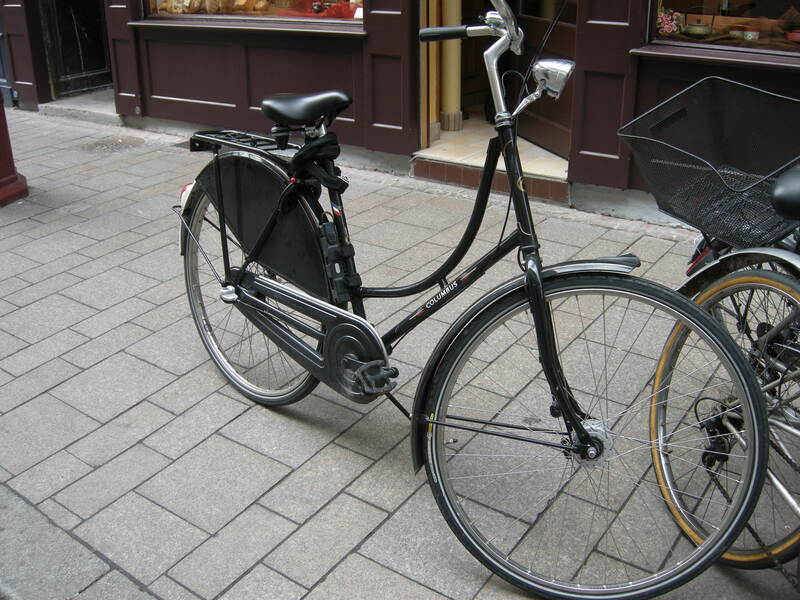 Generally everyone was using their own bicycle; the classic Strasbourg bike resembles the traditional Dutch Opafiets, but with a rather bendier down tube. 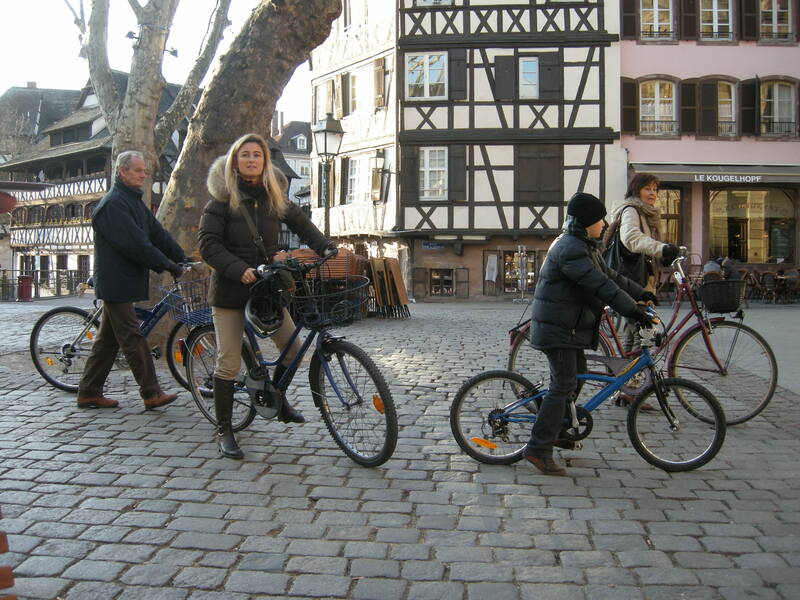 In short, cycling in Strasbourg looked like an obvious way to get around, and this was reflected in the large numbers of people, of every age, and of both genders, using bicycles as an everyday mode of transport. The reasons for this were not hard to discern. 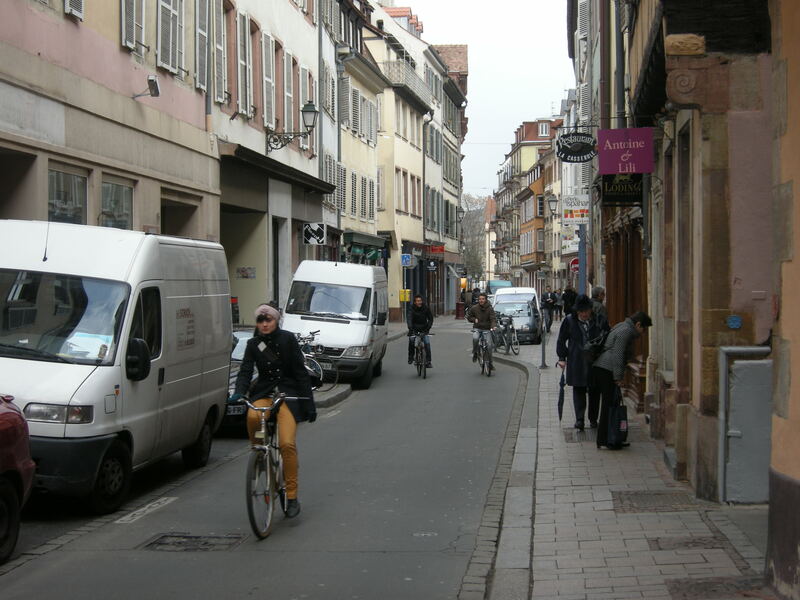 While not perhaps quite as subjectively safe as a Dutch city centre, it didn’t appear to be particularly dangerous, hazardous or threatening to cycle around this part of Strasbourg. 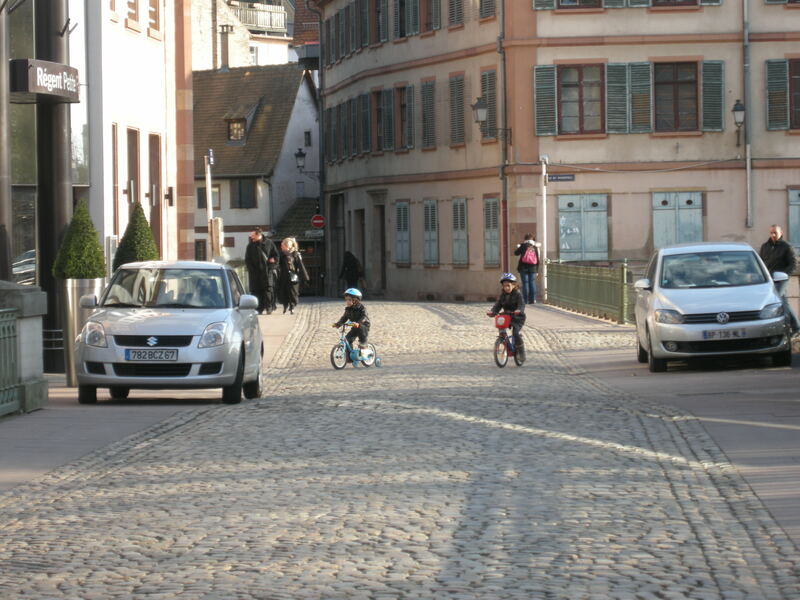 Parents felt comfortable taking their children around with them, principally, I suspect, because interactions with motor traffic would be minimal. 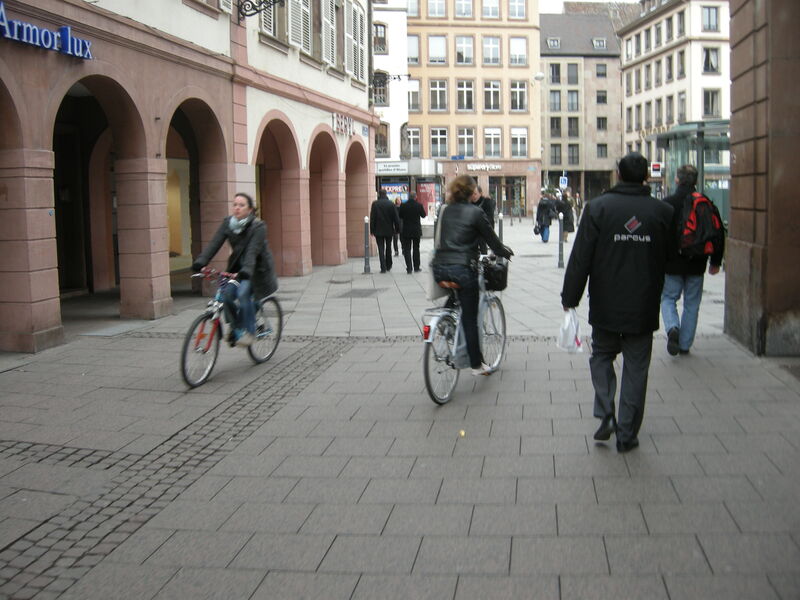 Plenty of streets in central Strasbourg are either fully pedestrianised, and allow cycling, or they only allow access, for a limited number of vehicles, for a limited period of the day. 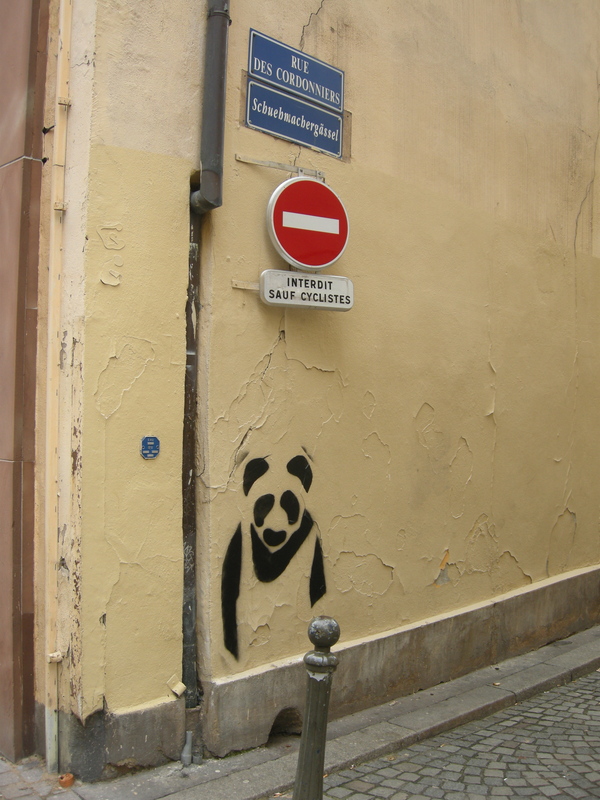 You can see a number of these streets – which are cobbled or paved – in the photographs above. 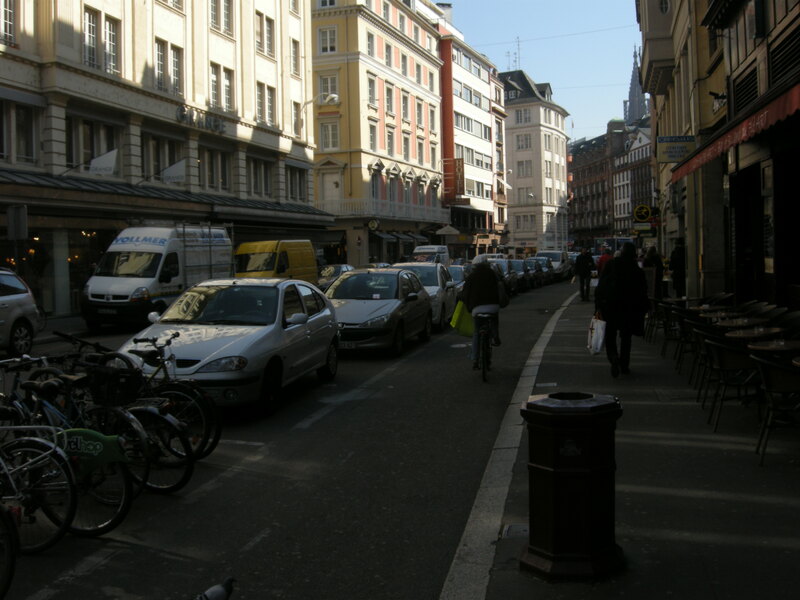 The street below is typical – only allowing authorised vehicles between 6am and 11:30am. Other streets which allow motor vehicles are almost entirely one-way; without too much investigation, I would guess that the alignment of these streets prevents them being used as through-routes, and allows access only. 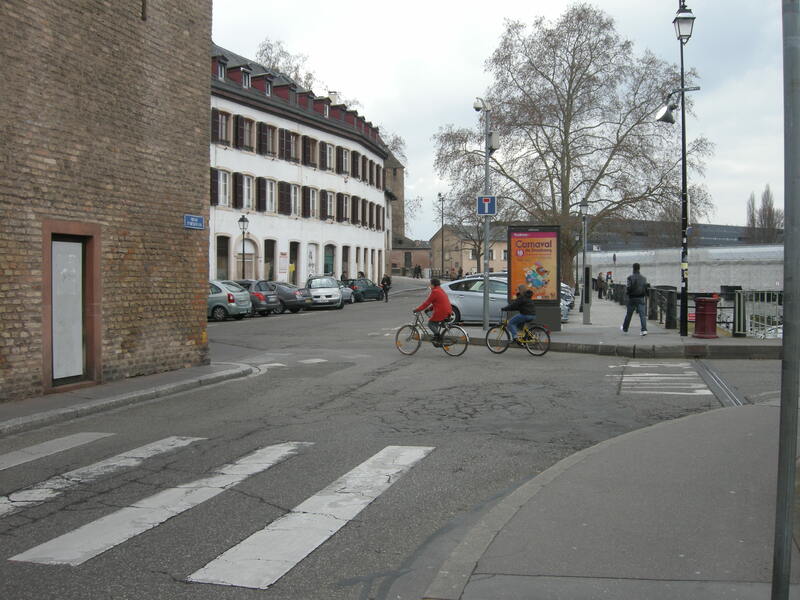 Again, as you can see in the photographs above, there are few motor vehicles using the narrow tarmac ‘roads’. Naturally cyclists are exempted from these one-way restrictions. 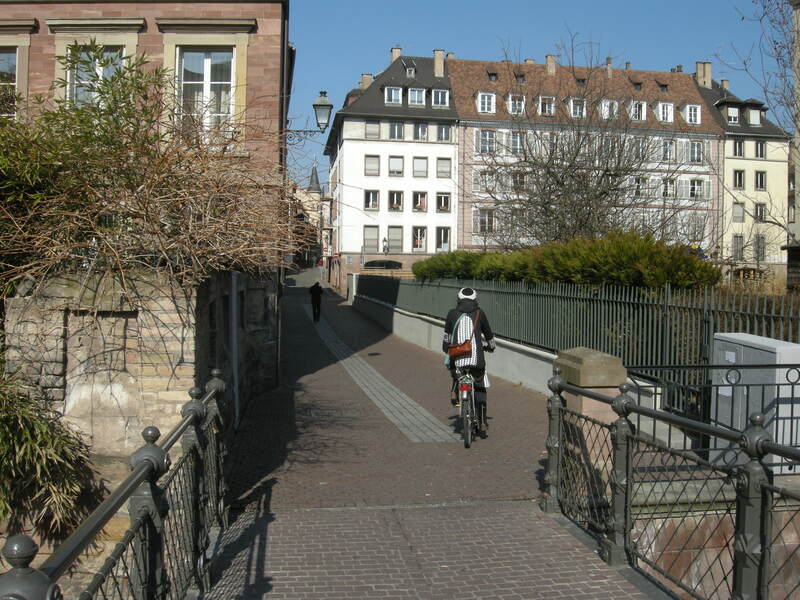 There are also bridges onto and off the central island of Strasbourg that are for pedestrians and bicycles only. 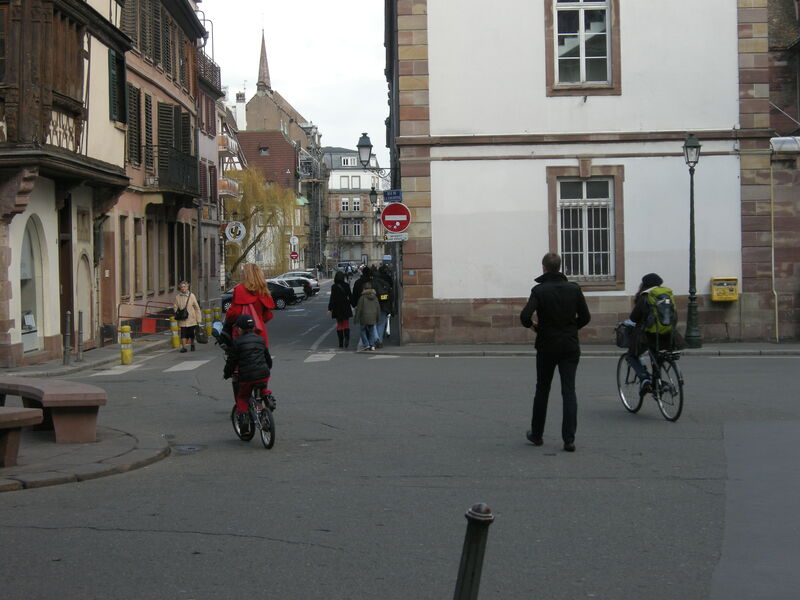 So the central streets of Strasbourg are generally quiet, with low volumes of motor traffic. 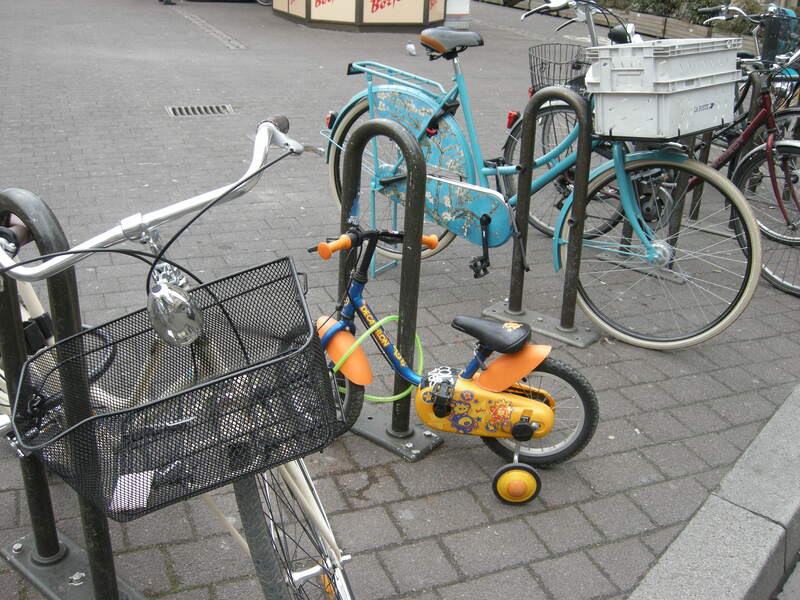 They consequently feel subjectively safe to cycle on. This isn’t the only part of the story, of course. 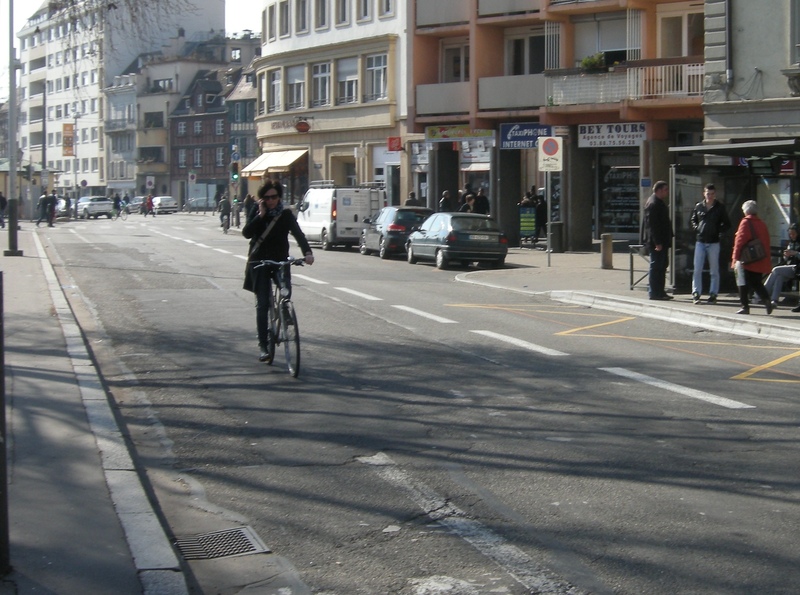 I’m not too sure how extensive cycle paths and tracks are outside of the centre of the city, but I certainly saw them alongside some of the ‘busier’ streets with higher volumes of motor traffic, and they were greatly used. On my last morning, a crisp, sunny Friday, I sat down for an espresso and filmed the above path in action for about 15 minutes. Below is the resulting video – admittedly selectively edited, but only to take out the periods in which nothing much was happening, due to the traffic light phases at the end of the bridge. The video is about half the length of time I was sat at the cafe. You can see a lady cycling with her dog, along with plenty of people cycling side by side. And children. Everyday cycling, in other words. 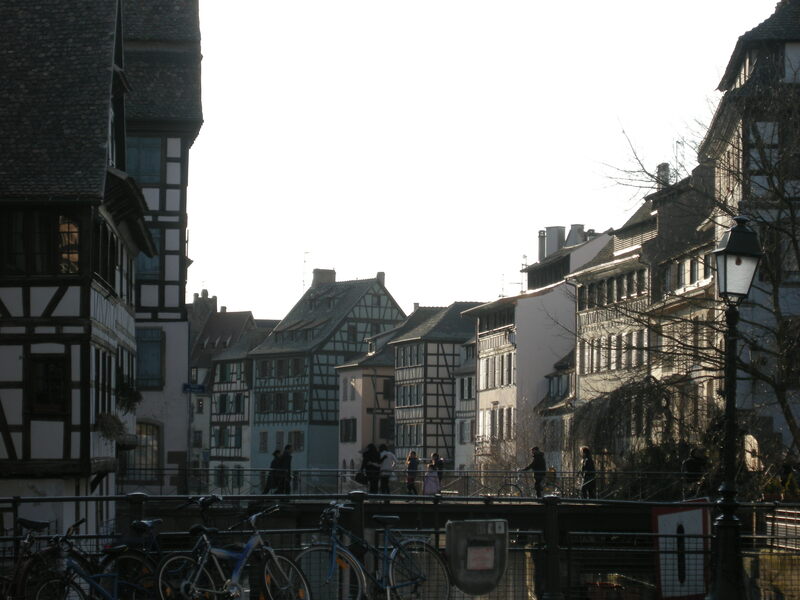 Strasbourg hasn’t got it absolutely right, of course – far from it. The infrastructure I saw, while much better than anything in the UK, was not up to Dutch standards. Likewise, a number of busy streets didn’t feel particularly safe for cycling, with quite heavy traffic flows, and no mitigating measures whatsoever for cyclists. 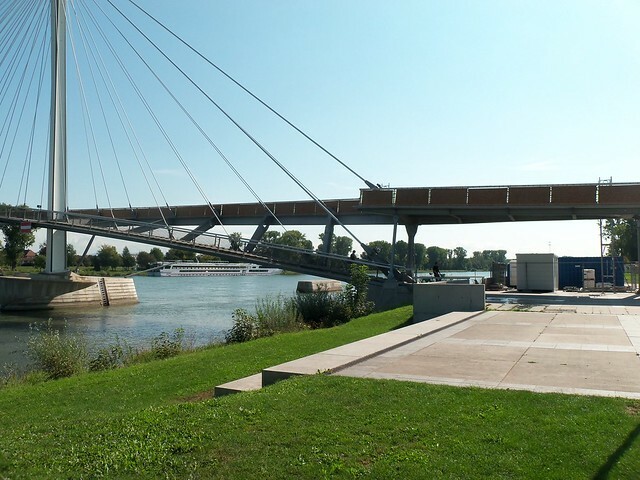 But the city does provide a good example of what can be achieved, and what can happen, when you implement Dutch-style solutions in a city, outside of the Netherlands. Create safe conditions, make cycling feel pleasant and convenient, and the bicycle becomes a natural choice, for everyone. 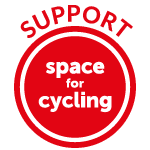 By contrast, if you pretend that the best way to increase cycling is simply to ‘encourage’ it, and implore any cyclists brave enough to venture onto your roads to ‘keep their wits about them’ in the absence of any other positive measures, any cycling revolution you engender will be stillborn. 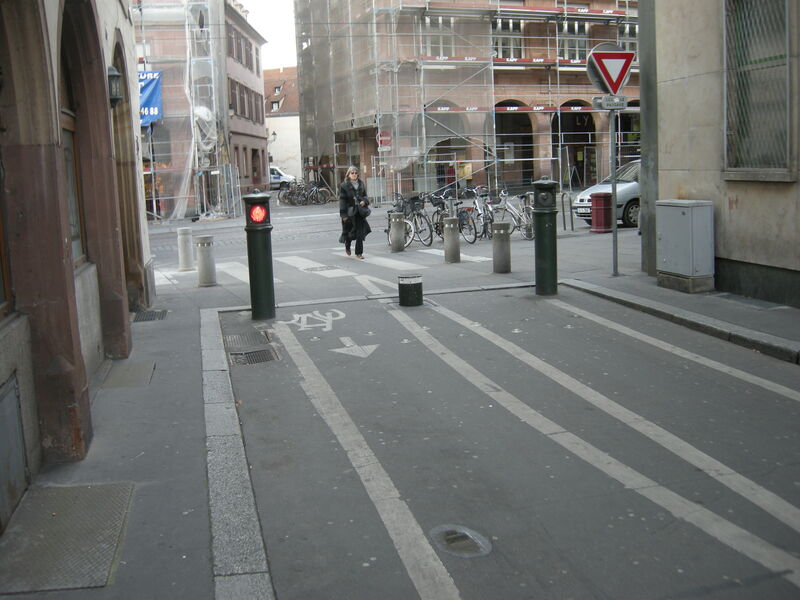 This entry was posted in Cycling policy, Europe, Infrastructure, Paris, Strasbourg, Street closures, Subjective safety, Transport policy. Bookmark the permalink. 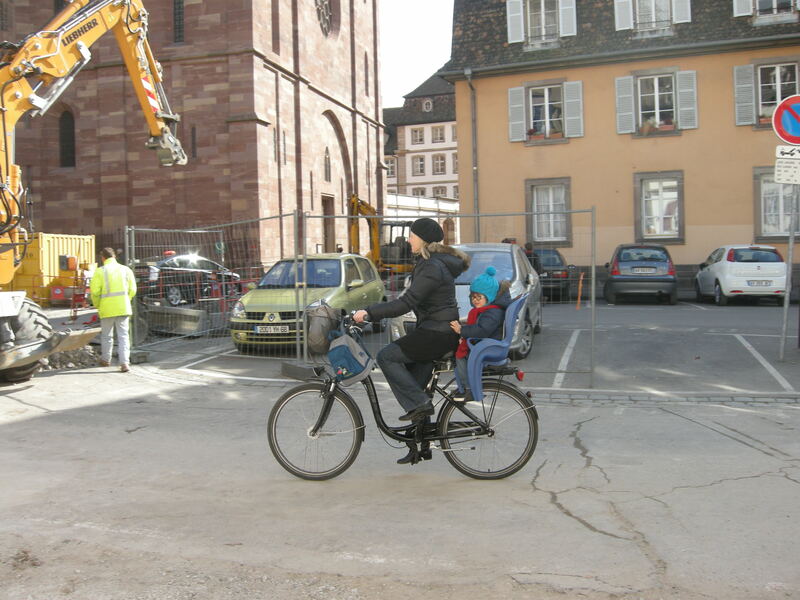 I cycled around Strasbourg on holiday some time before my children were born, which places it before 1996. Even then, it felt safe and pleasant compared with the UK. 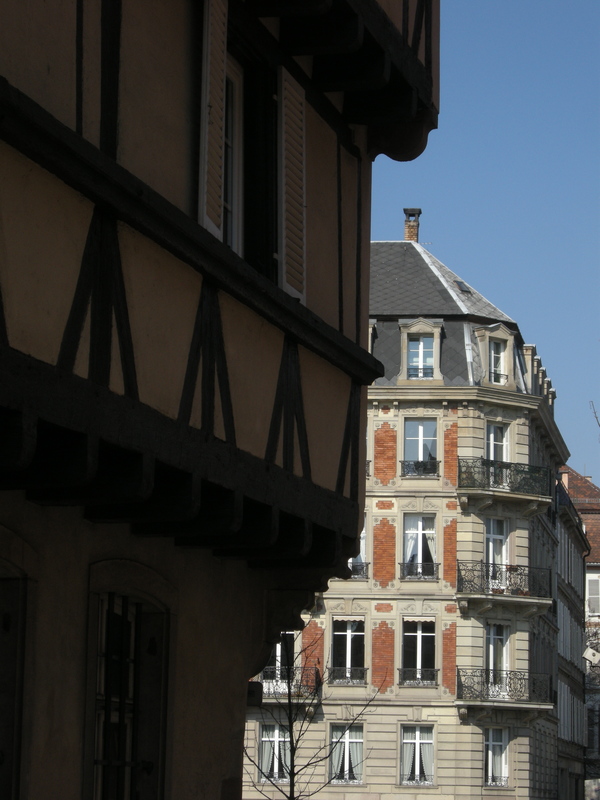 That might perhaps be related to the fact that Strasbourg is a historic city with a “patrimoine” which the authorities are anxious to preserve –(isn’t it a pity that UK local authorities are so willing to knock down old buildings and replace them with car parks and sheds?) 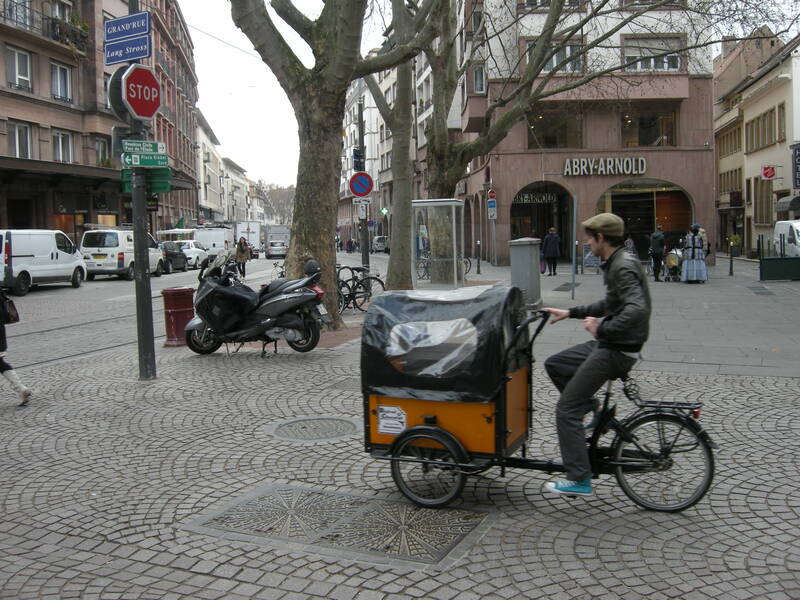 – as such, they would want to keep motor traffic in the old city to a minimum. 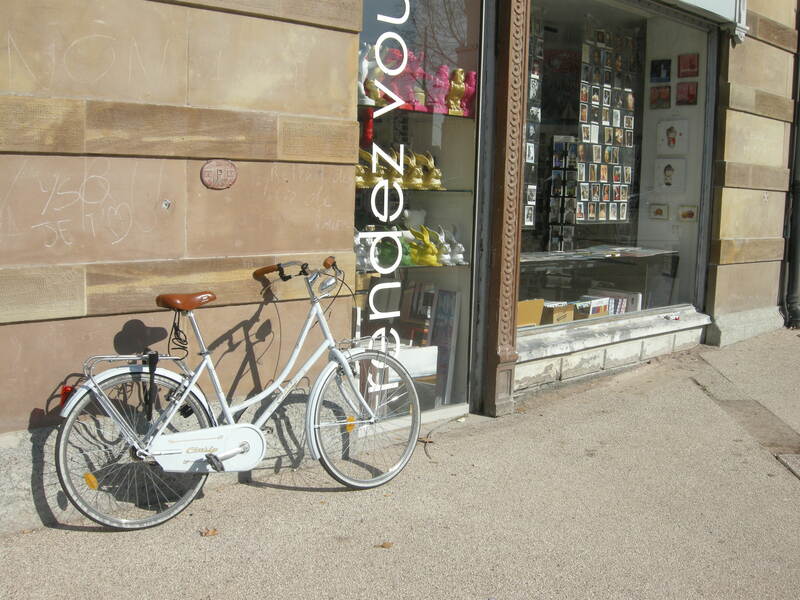 I have cycled quite extensively in France and overall I would say it isn’t too bad. If we had a scale of 1 to 10 and Netherlands was 10, the UK 1 or 2, France would rate somewhere around 4-6. Outside urban centres, cycling on busy roads doesn’t always feel particularly safe but traffic tends to take some care around cyclists. This could be due to the fairly unforgiving attitude of the courts to dangerous driving, to strict/proportionate liability which all European Union countries bar the UK (and about three Eastern European new entrants) have in civil law, and of course the frequency with which you see pelotons of club cyclists out on weekends. 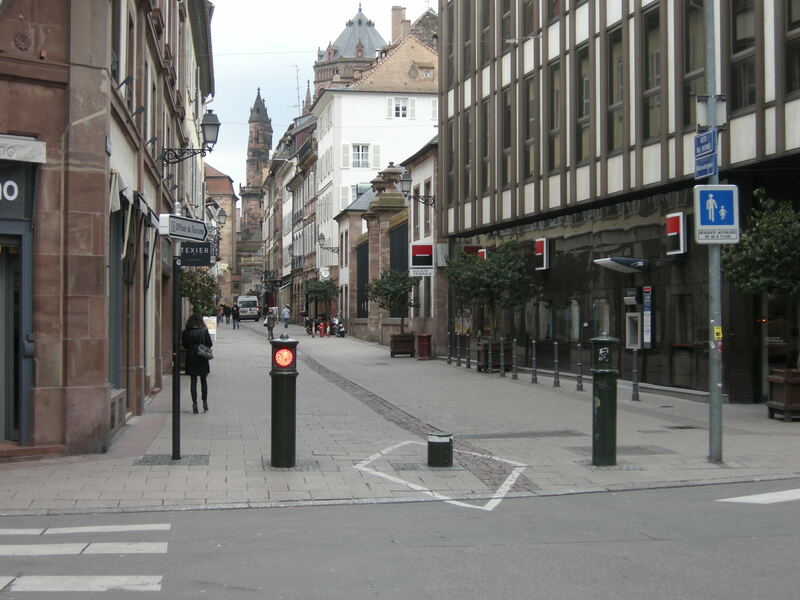 The major cities I know, notably Rennes, capital of Brittany, are like Strasbourg in that they preserve their historic centres by controlling traffic, permitting it entry only for access, and limiting parking spaces so drivers will look for parking spaces further out in the off-street car parks. The centres are pretty much all 30kpmh zones and have other forms of traffic calming, and you will see these also in small villages. 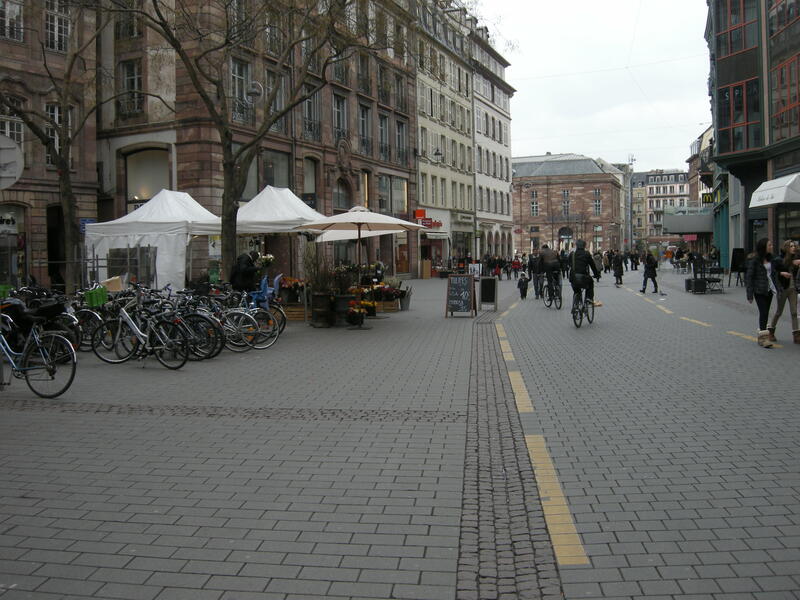 Key distributor routes around the inner ring will more often have cycle paths than the UK will, or the street layout will comprise a four-lane dual carriageway with a parallel narrow access street either side for parking and access to shops. These don’t look very tempting as rat-runs, perhaps due to width and parked cars, perhaps due to the way the traffic light phases work, so they are fairly tranquil for cycling. I can imagine that junctions are still tricky though. One notable exception is St Malo, where the streets are very narrow in the walled city and are all “sens-unique”, and seem to be open to motor vehicles for most of the day. The result is really quite unpleasant for pedestrians, evidently insupportable for cyclists (judging by the total absence of bikes inside the walls) and probably not great for drivers either. Along the Brittany coast, where most of the summer population are holidaymakers who either own a “residence secondaire” or rent one for three weeks or more, most people seem to want to park their car at the beginning of their stay and leave it there for the duration. 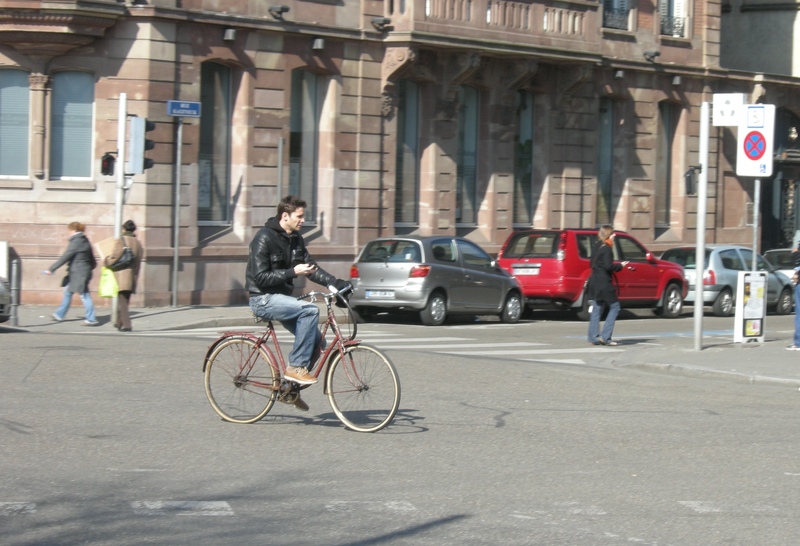 They get around on a motley assortment of scruffy old bikes, and the streetscapes have generally been adapted to them, with access restrictions for vehicles, 30kph limits, and various traffic calming measures like repeated tight-radius roundabouts, build-outs, alternating-side street parking, etc. There does seem to be a clear determination to subordinate “smooth traffic flow” to people on Shanks’ Pony. Boris could learn a thing or two….. Thanks for that Paul. Useful context. Well I just can underline your statements. in the center its very traffic calmed but also in the outer parts main roads are equipped with – at least – some kind of cycling infrastructure. 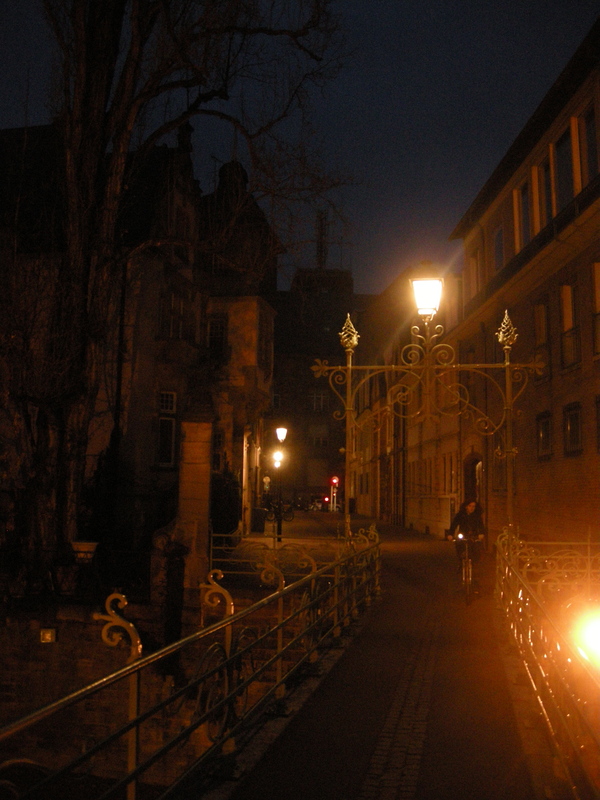 its very nice there to cycle, especially students use it as primary form of transport. 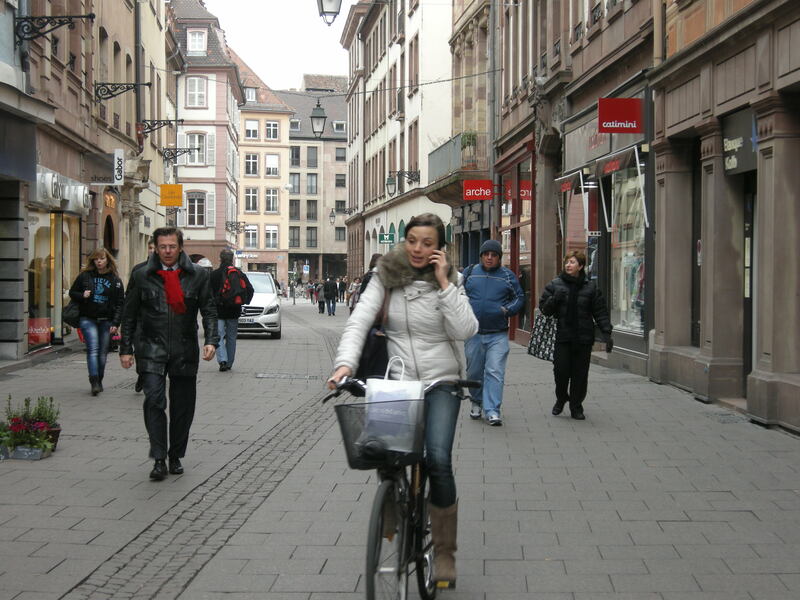 I’ve never cycled in Strasbourg, but it sounds like fun. I will have to see if I can make it there before I leave France this summer. 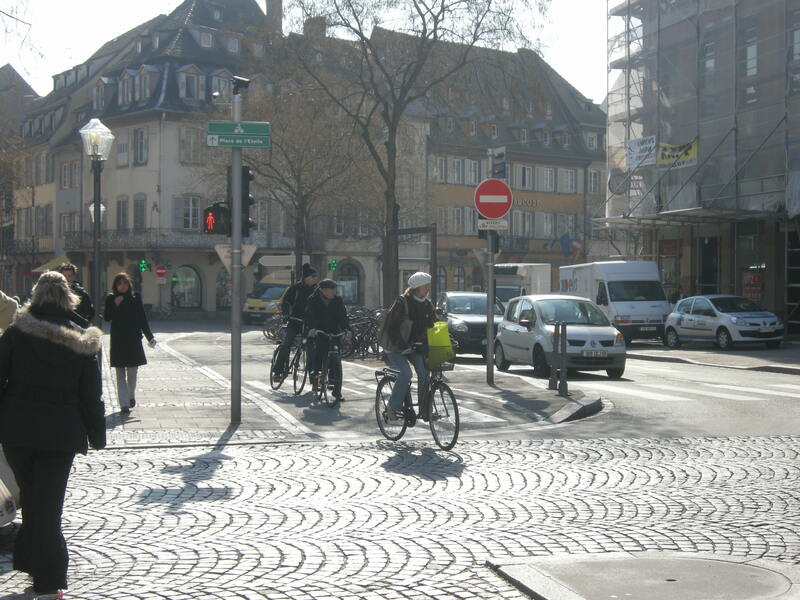 I’m looking forward to your comments on Paris, which is where I have been living; I cycle here almost daily. Nice pics! Looks considerably warmer than when I was there. Nice. It seems that the police also wear helmets (unlike in the Netherlands). 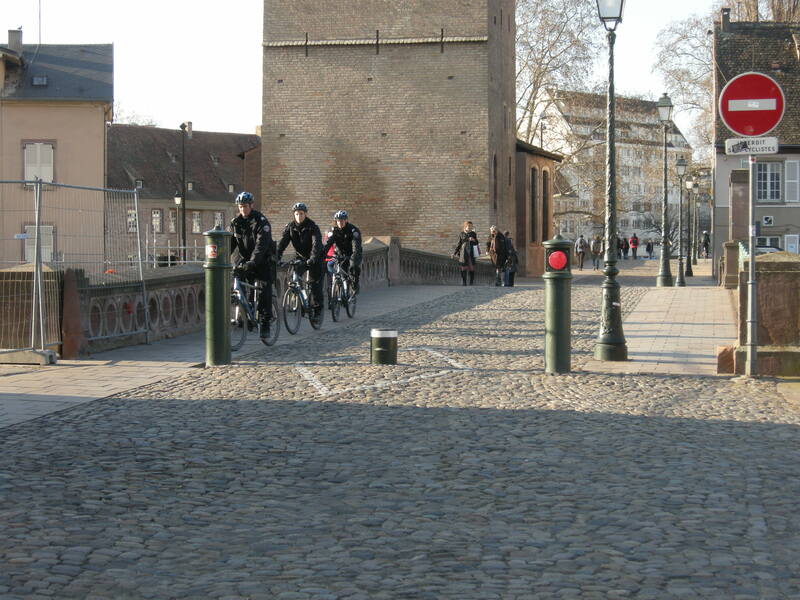 And still very few kids in the Netherlands wear helmets — most of the kids on the other side of Germany in Berlin wear helmets but I am not sure the kid-helmetism in Strasbourg is a Prussian thing. The police in the Netherlands wear helmets when on mountain bikes.